For the best deal around on your Toyota Tundra, look no further than your friendly, local Ressler Motors sales lot. At Ressler, you are going to find affordable prices, excellent selection, and friendly faces that will give you the kind of shopping experience that you are looking for. Whether you are in the market for a Tundra that is one year old or several, we have a great selection that is sure to be exactly what you are looking for. Check out our current selection online, stop by, or give us a call and let us know what you are looking for. After that, leave the hard work to us and get a great experience and a great vehicle at Ressler Motors in Bozeman, Montana. If you are looking for a truck that can keep up with the busy pace of your life, whether on road or off, the Toyota Tundra is the right truck for you. Rugged good looks, a powerful engine underneath the hood, and the best seat in the house when you get behind the wheel, there is nothing that this truck can’t handle. From paved roads to no roads at all, the Tundra isn’t afraid to get its tires dirty. Come take one for a test drive at Ressler Motors, and see why so many choose to buy their used Toyota Tundra at Ressler Motors. While there are other places that you could shop for a great truck, only at Ressler Motors are you going to get the kind of selection and service that you are looking for. No matter if your drive is long or short, it’s always worth the time and the miles that it takes to get to Ressler. One trip is all that it will take and you will know that this is the place, and these are the trucks that you are looking for. 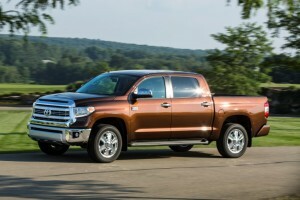 At Ressler, you will find an excellent selection of used trucks just like the great-looking, fun to drive Toyota Tundra. Stop by and find yours today.